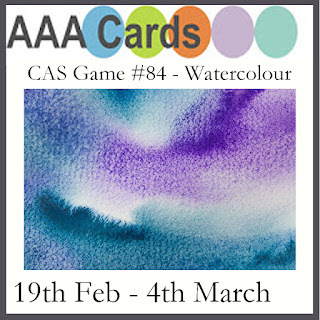 I hope you are all having a fun weekend and ready to join in our new challenge at AAA Cards. Michelle is our Guest Designer for this challenge. Check out her blog My Passion for Crafting to see her amazing projects. Gorgeous card, Sandie! I love the flower and your watercolour work. Loving your subtle use of watercolours with that gorgeous VI flower stamp. Beautifully CAS as always. Wow! Love the pops of yellow. Very clever idea! What a fantastic, bright, light and dramatic card! A favorite!! Awesome card! Love that flower stamp! What a fabulous card Sandie ! 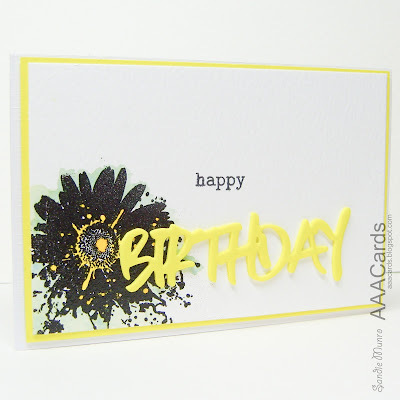 I love the contrast of the black flower with this soft yellow sentiment ! 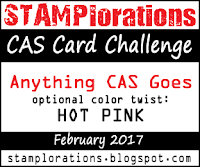 Gorgeous CAS card ! Thanks for sharing and for inspiring. Yes! so fab and CAS! Perfect example of CAS. Love the bright yellow you chose. Really makes your card pop. Thanks for joining us at STAMPlorations this month.